Sweetwater is an Authorized ESP Dealer. Nearly every order received by 3PM Eastern ships the SAME DAY! More than 30 years in business. Free tech support from audio experts. See each guitar in detail - We've photographed each of our guitars in up-close, multi-view detail. In fact, the photos you see in this listing are for serial number W18100785, the exact guitar we will send you. Get a good, long look at your dream guitar! Factory fresh - Your Sweetwater guitar hasn't been hanging in a store, suffering the abuses of dozens of would-be players. After our experts have inspected and photographed this guitar, it's been safely stored in our climate-controlled warehouse. 55-point Guitar Inspection - Before your guitar leaves Sweetwater, it undergoes an extensive 55-point inspection by our experts. We make sure it's safe, sound, and ready to play right out of the box. ESP LTD EC-1000QM Sweetwater Exclusive - Violet Shadow, Floyd Rose. Solidbody Electric Guitar with Mahogany Body, Quilt Maple Top, Mahogany Neck, Rosewood Fingerboard, 2 Humbucking Pickups, and Floyd Rose Bridge/Tailpiece - Violet Shadow. With the ESP LTD EC-1000QM FR solidbody electric guitar plugged into your amplifier, you're primed for pure rock'n' roll. You get eternal sustain from the Eclipse's set-neck design, which keeps it resonating longer than bolt-on designs. You'll have powerful, articulate tone on demand, thanks to EMG humbucking pickups, and thanks to the Floyd Rose vibrato, a ton of expressive potential is on tap. Find out why some of the most aggressive guitarists choose ESP - get your LTD EC-1000QM FR from Sweetwater today. Classic looks with modern performance. 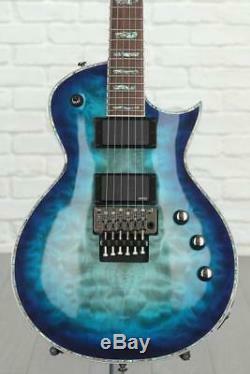 Nothing screams hard rock like ESP's timeless body style. The extra mass of this single-cutaway design gives the EC-1000QM FR truly epic sustain, whereas its slightly arched top provides you with comfortable hand positioning no matter your picking style. Add to that a super-sharp cutaway, which gives you open access to the EC-1000QM FR's upper frets, and you're ready for superior playability. For serious tailpiece manipulation, the EC-1000QM FR comes equipped with a genuine Floyd Rose vibrato. This incredible bridge/tailpiece lets you grab on, rock out, and never worry about going out of tune. You'll get both the rock-solid reliability and the tight response you need. Hard rockers and aggressive players have turned to EMG active pickups for years for their amazing tone, exceptional dynamic response, and reliable performance. You get EMG 60 and EMG 81 humbucking pickups in the EC-1000QM FR, ready to sound as clean or as mean as your style calls for. 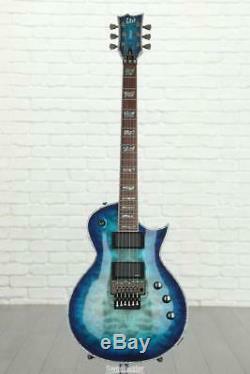 ESP LTD EC-1000QM FR Features. Classic-looking electric guitar with exceptional sustain and aggressive tone. Thin U-shaped profile makes the mahogany neck play fast and smooth. Dual EMG pickups give you aggressive tone, hot output, and excellent note definition. Floyd Rose vibrato lets you perform big bends with excellent tuning stability. Set-neck construction gives you long-lasting sustain and excellent articulation. Some products are not returnable, including. Discontinued products, closeouts, and used products. Personal items earphones, harmonicas, mouthpieces, etc. The item "ESP LTD EC-1000QM Sweetwater E (Guitar #W18100785)" is in sale since Wednesday, January 9, 2019. This item is in the category "Musical Instruments & Gear\Guitars & Basses\Electric Guitars". The seller is "sweetwatersound" and is located in Fort Wayne, Indiana.